Subsidence monitoring in Aguascalientes started in April 2003 using GPS static surveys and in 2008 the study was complemented with Differential SAR Interferometry using Envisat archived data acquired by the sensor since December 2003. 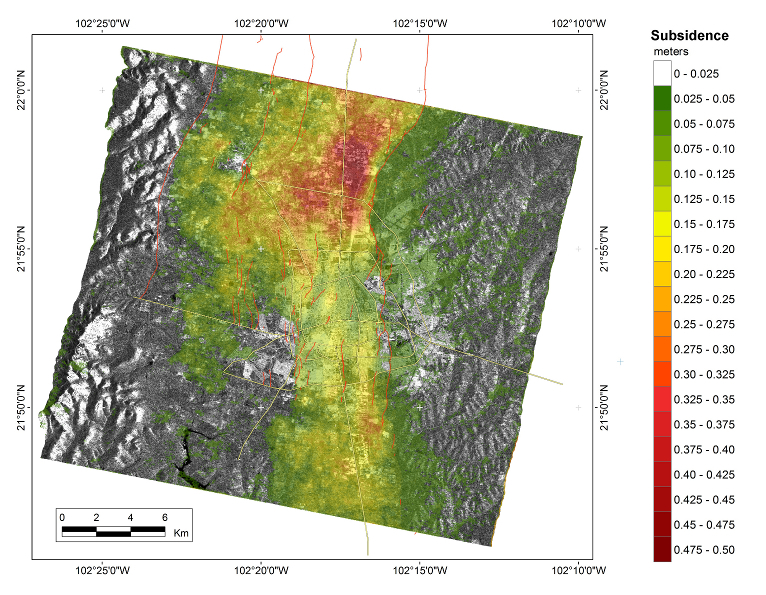 Monitoring results to date include subsidence maps for Aguascalientes City and surround areas which show subsidence maximums of 15 centimeters but with a decreasing rate with time. Recent implementation of TerraSAR-X images allowed to extend the study area and a more accurate estimation of displacements, which are being used for subsidence mapping and to develop models for corrections to geodetic positions. Results of the study are also being used for the development of the State's atlas of hazards and will contribute by detecting new ground failures and areas susceptible to failure.